You have honoured me by inviting me to give this oration, but you have given me an impossible task. You have asked me to put words on that on which words cannot be put: the First World War, the so-called ‘war to end all wars.’ And we do so today because we say this is the centenary of the end of the First World War, and so, in some limited way, it was an end. The guns did fall silent on the Western Front. But the suffering and dying did not end. M. Bradley from North Main Street, Daniel Buckley from Boherbue, J. Dawson from Sunday’s Well, James Gloster from Quaker Road, William Kingston from Leap, John Murray from 26 Horgan’s Buildings, Denis O’Connor from 141 Burnt Lane in Shandon; William O’Keeffe from Cork; Nellie O’Neill (yes, a woman – women who seldom get mentioned) a nurse from Ballyrussell in Cloyne; P. O’Sullivan from Inchigeelagh; William Skuce from Ballydehob; H. Teskey from 2 Castleview Terrace, Lower Glanmire Road; and Patrick Madden, from 66 Maddens Buildings, Watercourse Road, Cork – these would all die this month one hundred years ago, after the armistice. In so many ways, in countless homes, the war went on and did not end. Still today, we live with the outcomes in a world that was transformed forever by that war. At a human level people lived with the grief and the wounds. In my pocket I carry what, to my grandmother were treasured keepsakes, sacred relics, as it were – some of many – of the man she loved and married in 1916 and who eleven months later was killed in action: two lace handkerchiefs from Belgium. Channeling that grief into her care for the wounded she met my grandfather , returned to inner city Dublin carrying wounds from British East Africa. By the time of my childhood in the 1960s and early 1970s I remember him putting on, every day, the specially adapted boots provided by the army to alleviate his wounds. One hundred years is not a long time ago. Our presence here today is not about trundling through the painful and contested politics of the 100 years since. We are not here to debate were they right or were they wrong? Neither do we judge. We have the luxury of looking back at the First World War through the lens of our own experience, opinions and knowledge – a view from above – aerial snapshots – that have been shaped by 100 years of life since. There is no glory in war. We do not celebrate. We commemorate. We remember. We are here because, fact of facts, people, human beings, in all the diversity of their personality, backgrounds and humanity, fought and died. It was tragic. It was devastating. Such was the ghastly horror of it all that those who came home were silent. We too should be lost for words. The people we remember today did not have that 100 years of reflection since . In the midst of it, they did what they did, for reasons we cannot fully know, but for them ‘it was the right thing to do in their time.’ When we venture our opinions on it all we tread on the holy ground of other people’s lives – people like us, and we have to be very careful not to abuse that remembrance by harnessing what we think about them to our own contemporary ends. We must not judge them, as I say, from the comfort of our own high moral ground and the omniscience of our hindsight. We are here today simply to remember them; to remember the awfulness of it all, the deaths, the wounds, the scars, mental, emotional and physical, the gaps that stayed for ever – in individual lives, in families, in communities, in societies, and in nations. Whatever our current outlook we can all agree that people died; that there was unimaginable and ghastly suffering; and that the world has never been the same since. Our world still shudders. Today is not a day for analysis and debate; it is a day for gazing into space in dumb-founded silence and, in our faltering way, from the vantage point of our own human vulnerability, to try to take it in. But it is too vast, and this is not easily done in the case of a war that was unfettered and industrialized: ‘total war’ – the complete mobilization and subordination of all resources, including policy and social systems to the war effort. We talk about nearly 10 million deaths, but that takes account only of military personal. There were 10 million civilians too. When the wounded are added in we can talk about 40 million casualties. Our mind cannot take numbers like that in; at least mine can’t. Here today we see this in personal and local ways. In the Cork I grew up in only half a century ago (one hundred years is not a long time) I remember no public remembering at the half-century point. In fact, I arrived in Cork Grammar Junior School in the autumn of 1968 at that half-century point, and every school day from then until 1976 I walked passed the school’s brass war memorial. As students we ignored it. It was never spoken about. Today, thankfully, in the Ireland that we have become, we now speak about these people, many of whom stayed silent. Our remembering is public, as it should be. Our remembering takes on real significance when, as we have done in St Fin Barre’s Cathedral for the last four years, ‘we put faces on the names carved in stone’. ; when we think of where they lived and who they were; when we think about them in our own locality; when we put ourselves and our families in their shoes. 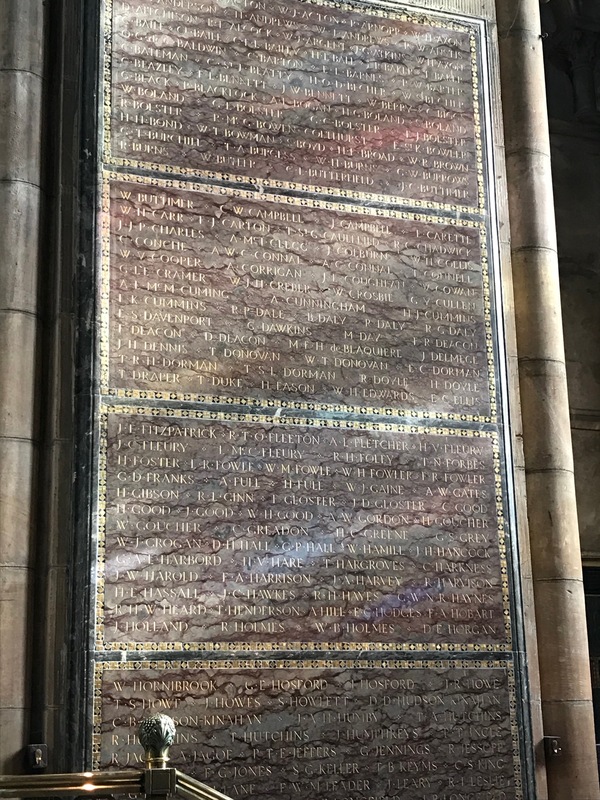 Looking at the 53 names on the memorial at Ashton School last week – the old Cork Grammar School – I saw the names of the sons of five clergy in this Diocese. I thought of myself and my sons. It is human nature to think of ourselves, but from that vulnerability is honed the emotion and empathy of our remembering today. As I sat throughout yesterday keeping vigil in St Fin Barre’s Cathedral looking at the faces of those whose photographs we managed to collect, I saw people kneeling to pray, others leaving in tears, and others transfixed or stunned by it all. When the bells rang out to signal the end of the war – there was no joy in those homes on this day. And their names are not on this memorial here, or on the memorial in St Fin Barre’s Cathedral. I wonder are their names on any memorial here in Cork? Thomas Warren was from 72 Grand Parade – over there – he died 100 years ago last month. Thomas O’Meara lived at 23 Grand Parade. He was just 19. Where are their memorials? Of the c. 4,200 Cork people who died in this war some are remembered no where in Cork. There are only 145 names on this memorial. There are 377 on that in St Fin Barre’s Cathedral; but that was a Church or Diocesan memorial – they were all members of the Church of Ireland or of the Protestant churches. Again I ask, is it not time that we should have one memorial where the humanity of Cork, city and county, regardless of religious affiliation, or none, are memorialised together? It was all so local as we see in the names of the people and the places where they lived – they all deserve a local memorial here in Cork. The war ended but, truth be told, in the century since, there was not peace. Still today we live with conflict and human division. We are here to remember. Now, in our time, we acknowledge the equality of suffering on all sides of such conflict. What of now? What does our remembering do to us today? It gives us pause for thought and makes us reflective. Should it not also make us vulnerable, so vulnerable, especially those of us of a liberal mindset, that we are disturbed – vulnerable and disturbed enough to challenge our own complacency. I want to repeat what I said here in 2016 in the centenary year of the Battle of the Somme. Is complacency not the achilles heel of the contemporary liberal mindset – such that we assume that ultimately all will be well? But will it? Complacency does not take account of the fact that history risks repeating itself and that we have not learnt lessons from the past. Our remembering therefore, should give us resolve – each one of us – resolve to challenge anything, anyone and everything that risks creating the circumstances in which any of the ghastly horrors of the past might have the remotest possibility of mutating into something horrific that might root in our time. We will remember them. They knew nothing of what our world would be and become. Their faces do stare at us across history, and their stories resonate, and we realise that there are questions for us in our time – for us of all outlooks – religious and non-religious, Christians of all ilks, faiths of many types, atheists with their intrinsic philosophy and value systems, humanists with their ethical philosophy of life and concern for humanity in general – all of us must build bridges, join hands, work with our difference, and try to meet minds to address these questions; what have we become? what are we becoming? Or more menacing still – what do we risk becoming? The war memorial in St Fin Barre’s Cathedral, Cork which commemorates members of the Church of Ireland and Protestant Churches who died in the First World War. Today Bishop Paul Colton called for a shared memorial to be erected in the city or county naming all the c. 4200 Cork people of every background. This entry was posted in Bishop, Centenary, Community Involvement, Cork, Diocese, Remembrance, Remembrance Sunday. Bookmark the permalink.